Melanie has been with Harbor Road since 1998. She has an associate's degree from the University of Maine at Augusta. She has a grown son as well as two cats and a bearded dragon lizard. In her free time, she enjoys knitting, reading, gardening, cooking and hiking. 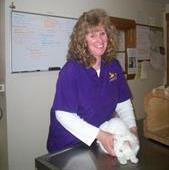 Michelle joined Harbor Road in March of 2008 after managing a local animal shelter for five years. She has always enjoyed working with animals and loves to visit with and care for patients here at the hospital. She lives with her husband two dogs and six cats! She loves spending time with her grandchildren, gardening, reading and fostering animals for the shelter.